Read recommendations for academic governance and the university community's response. In April of this year, we began a university‐wide discussion of academic governance at UMUC. As you know, we are exploring nontraditional models of academic governance because UMUC is not a traditional university, and it is vital that we maintain our agility, flexibility, and responsiveness to the needs of our working adult students. As part of this important discussion, we hosted an academic Town Hall with members of the core faculty, followed by breakout sessions with the deans of the graduate and undergraduate schools. This web page was updated with relevant information and resources, and all were invited to comment via the feedback form on the right. In addition, between June 25 and July 21, we hosted nine facilitated small‐group sessions for faculty, soliciting perspectives and feedback. Finally, the deans of The Graduate School and The Undergraduate School—together with a working group of core faculty—have completed a report that proposes new guidelines for academic governance at UMUC. The report of the deans and the working group has now been posted to the "Resources" section on the right hand side of this page, along with a historic summary of academic governance at UMUC and the draft of a white paper that will serve to frame a series of recommendations—on academic governance and other important subjects—that will ultimately be submitted for consideration by the University System of Maryland Board of Regents. We invite and encourage you to review the report of the deans and their working group, the historic summary, and the draft white paper, and to share your comments, by September 15, via the feedback form on this page. We will review both the report and your comments before completing and submitting final recommendations to the USM Board of Regents this fall. Many thanks to all who have participated in this critically important discussion on the future of academic governance at UMUC. The following feedback was received during the comment period. All questions and comments have been reviewed and considered by academic leadership as part of this process. We thank everyone who participated. Comment: I need to commend the authors of this new educational approach. However, after 45 years of experience in educational program development, teaching and running private high-tech industries, I have developed a unique program, which is Modular in nature, it is tied to industry's need, and lowers the financial burden on students. I need to be able to upload a copy for your review and consideration, or having the opportunity to present it in person. Response: Thank you for your comments. UMUC's adjunct scholar practitioners are powerful role models for our adult working students, and their contributions bring great value to faculty communities of practice. We encourage you to share your ideas with your program chair and colleagues. Comment: Since NOL faculty are being 'phased out' with no idea of how many courses we will teach (from 4 to ?? ), is there a process by Jan/Feb. to discuss our future with our Program Director, as well as Dean? Losing our medical benefits, job searching while grading 4 Masters courses, etc. may be very stressful by late Spring. I still plan to be active at Commencement and would like to continue my active teaching or even instructional design roles with UMUC. Response: Thank you for your comment and question. As previously announced, the NOL designation has been phased out at UMUC. Your program chair will be happy to discuss specific teaching assignments or other opportunities for contributing to student learning at UMUC. Comment: Will any serious consideration be given to letting overseas adjuncts teach up to 24 credit hrs. w/in a given AY? Thank you for your time and consideration to this inquiry. Response: Thank you for your question. All adjuncts, no matter where they teach or in what modality, can teach up to six courses per year (two per term). This will not be changing. Comment: Why are their programs (MSDA) that have syllabi that are not completed or providing specific information? It seems like the Course Chairs in many of the classes I teach lack any idea of quality control, make so many mistakes in the syllabi and curriculum and assignments. This reflects very poorly on UMUC, on unfortunately on Adjunct instructors who take the brunt of criticisms for poorly designed and implemented curricula. Response: Thank you for your comments. We have heard the need for additional avenues for adjunct feedback on their courses and this is reflected in our report. Comment: As part of the faculty governance process we need a method of systematic meaningful feedback. UMUC faculty needs feedback on quality of teaching. UMCP recently adopted university wide procedures focused on both developmental and evaluation activities to assist faculty in improving and in ensuring quality of teaching for student learning. Response: Thank you for your comment and suggestion. The proposed AAB structure and purpose is tied directly to the quality of the academic experience, an important component of which is quality of teaching. It is envisioned that the AAB would play a very important role in advising on the design and structure of a faculty quality feedback system. Comment: In the draft White Paper: Building the University of the Future, the following was stated: UMUC has already identified key indicators that are present in the first few days of a student's initial class as predictors of success in a program. Would you advise where/how I can learn more about these indicators? I look forward to being involved in the community of practice in my academic department. An idea that came from the focus group I was in was to have a feedback form (could be electronic) that faculty could use to give input to items that need to be revised, edited, added after teaching a course. I support that suggestion and hope to see it implemented. Response: Thank you for your suggestion regarding a mechanism for gathering faculty feedback, as well your interest in the research UMUC has conducted in the area of predictive analytics. You can learn more about this work at the Center for Innovation in Learning and Student Success (CILSS). On the CILSS website, you can find information including an annotated bibliography of resources related to this subject. Comment: I am very pleased to strongly endorse the recommendations for academic shared governance at UMUC. As a former chair of the UMUC Faculty Advisory Council, and as a member of that body for six years, I believe the restructuring of academic shared governance to the formation of an Academic Advisory Board (AAB) makes much sense given the nature of UMUC and its uniqueness within the University System of Maryland. Furthermore, the development of communities of practice, as described, will help to assure that adjunct faculty members can have opportunities of influence on curriculum and academic affairs within the context of their disciplines. I wish to also applaud the documenting of the history of academic shared governance in a separate document; this reflects a tremendous amount of research into the recent (and not-so-recent) past of UMUC. Most importantly, it illustrates the fluidity and evolution of shared governance as UMUC grew from being a department of the University of Maryland, into a campus, into becoming a separate university of the University System of Maryland. It also reflects well the dynamics of the overseas divisions and how they evolved, grew, and ebbed, over several decades. I note some key omissions which I hope will be addressed in the context of an emerging AAB. For example, this document addresses faculty shared governance but does not address student or staff shared governance roles. Shared governance for these groups need to be articulated in relationship to an AAB. Finally, I take one small exception to the authors wanting to avoid using the term shared "governance" — I would not shy away from calling this shared governance, for that is very much what it is. It simply reflects the nature of UMUC and how we operate as an academic institution. Again, I applaud the effort and outcome here. Please let me know how I can support this process as it moves forward. Response: Your expression of support is appreciated. Thank you as well for suggestions regarding preferred terminology and the relationship of a proposed Academic Advisory Board to student and staff governing bodies. Delineating such relationships was beyond the scope of our recommendation. But it is worthy to be considered at a future time. Comment: Within the nine elected members (voting members) of the AAB, at most only 1/3 can be adjunct instructors, who do the majority of the academic practice. This does not make sense. Furthermore, as I said above, "At most only 1/3/ can be adjunct instructor." There is no guarantee or safeguard in place that even one adjunct instructor, the ones who do the majority of delivering the academic content, will be on the AAB. Response: Thank you for your comment. The proposed model prioritizes entire programs, rather than individual courses, as a primary focus of academic governance. Given this scope and function, for the AAB to operate effectively, it will need the expertise of collegiate faculty whose primary role and responsibility is to ensure the quality and coherence of whole programs. At the same time, we recognize the importance of receiving feedback from our adjunct faculty—scholar practitioners with knowledge of their profession and subject areas. For this reason, we have recommended that the schools develop more specific and formal opportunities for adjunct faculty to communicate about their courses and program curricula. Our recommendation was limited to the basic structure of academic governance, without going into the details of implementation. We expect that further refinement of the model will be necessary, and assume that many details of implementation and procedure will need to be determined by the new governance group itself. Thank you! Everyone needs an editor. The spelling has been corrected. Comment: I have broad experience in social and for profit turnarounds as a senior executive. I have also been an adjunct for 18 years. I continue at UMUC because I believe I can contribute is something that makes a difference. Significant faculty politics will cause me to leave. Faculty engagement needs to align with the mission- in this case transformation of student learning. Most of the governance discussion misses the focus on mission. Community of practice COP is great model for engagement, intellectual sharing and involvement. In a well done COP there is a facilitator, exchange is ongoing and deals with substantive issues that matter. Using COP for curriculum review or faculty feedback is not a good use of the COP model. The success in COP is learning and focus on problem solving and development—not evaluation and feedback. I do not support the representative faculty committee approach as a meaningful method to engage faculty. The faculty I have met who are interested in governance do not represent my views and do not indicate a focus on transformation of learning for students. Significant improvement and organization change is dependent of leadership. Faculty are the lagging participants now so more attention to the dissident group will retard significant improvement. Response: Thank you for your thoughtful contribution to this conversation. Improving the student learning experience is at the core of all we do, and responsiveness to this mission informed our proposal to create an Academic Advisory Board focused on ensuring our programs meet the needs of students. Also well taken are your points regarding the most effective mechanisms for facilitating different kinds of communication; we will certainly take these ideas into account as we develop structures for ensuring that all faculty—whether or not they wish to participate in governance—are able to share ideas and contribute feedback on their courses and programs. Advisory committees or bodies are not part of "governance" since they have no authority. If the University truly wants diverse governance, it needs to be accountable to those constituencies, not be free to ignore them. The White Paper continually emphasizes being student centered and responsive to its constituents, but the very constituencies that are the future of the University are absent from the governing structure. For example, adjuncts are working professionals outside the ivy covered halls who may have more valuable insight into curricular issues than those isolated inside, the same for recent alums. It seems to me that if the University governance wants to remain relevant and have its pulse on change, it needs to include successful alums from the last five to ten years on a governing board. These alums will have a practical insight of what was useful to their success from the curriculum and what was not. This should be accompanied by a rigorous survey mechanism to get more in-depth feedback. The same could be said of adjuncts. If you stack the governance mechanism with what you've had, you will get what you got. While "only an adjunct" I would offer from observations as Fortune 500 consultant and DARPA and NSF Research Program Manager, that the world of practice is frequently far ahead of academic theory and curricula. The practitioners are creating the future, not the academy. Response: Thank you for your response and suggestions. Our recommendations concern only academic (faculty) governance, and assume the continuation of student representation (SAC) and other shared governance groups such as AFA and STAC. The perspective of adjunct faculty is critical, and we have recommended that the schools develop a structure for improving communication among all faculty. We know that the success of UMUC's learning model depends on the expertise and passion for teaching of its scholar-practitioner adjunct faculty. These faculty bring a deep knowledge of their profession as well as their subject area, and serve as role models and mentors for our adult students. Comment: My thanks to everyone who spent long hours thinking about and drafting the various reports. Since the university is an "open university" it allows under-qualified students who lack basic reading comprehension, grammar, spelling, writing, and analytical capabilities to enter the college. Many of the students arrive with a substandard background and fail to learn or pass a course. Because the university neglects to impose course requirements, unprepared students (who also lack basic skills) are allowed entry into upper level courses that must be more rigorous and require greater knowledge and skill sets than a 100 level class. Again, this creates an environment where under-qualified students fail or they drop the course. There are few UMUC undergraduate students who are capable of being "mentored" in the new vision of faculty set forth in the draft. Students, no matter how much "experience" need instruction, especially since most UMUC students did not perform well in elementary or high school. The draft description of faculty and students is based upon a faulty premise. It assumes UMUC students are well-educated. Having taught UMUC students for twelve years in courses from 100 to 400 levels, it is rare to see a qualified student. "Competency" equivalents will not be applicable to more than half of the UMUC student body. Indeed, they are irrelevant and obscure basic deficiencies. They set up students to fail, again. Therefore, no matter what new programs are introduced, the university's core problem or challenge of teaching students who lack important basic skills remains. Do not depend upon the writing center tutors or remedial courses; they have failed. With eight week classes, professors lack the time to correct students' work that should have been addressed in elementary school. If you want to impress employers, solve that problem first. Response: Thank you for your comments and suggestions. UMUC is an open university. As such, we are dedicated to meeting our students where they are and providing them with a world-class learning experience. Our students are truly extraordinary, and we are honored to play a role in enabling and furthering their success. Comment: Thank you for the opportunity to read these proceedings. They are lengthy and somewhat complicated for an adjunct. Selfishly, my concern is whether adjuncts will continue to have a teaching role at UMUC as I think they are important and lend a well of variety and experience to the teaching "pool." I have taught at UMUC from over a dozen years and prior and during that time I was also a university administrator and teacher at a community college so I come with some background and experience in higher education and interest in this process and am therefore anxious to be informed and even included in meetings where possible in the future. I live in Virginia so can partake in person sometimes if this would be useful. Response: Thank you for your response. Yes, adjunct faculty will continue to play a central role in instruction at UMUC. They truly meet all our adult students where they are, provide them with a world-class learning experience, help them to achieve their career aspirations, and support their continued success. Comments: I have read through the recommendations for the AAB and like the clarity of the mission and its purpose. I do have several comments and recommendations, which stem from my experience being both a FAC member and an overseas (ED) faculty member. First, using the proposed recommendation, there would be 10 voting members of AAB; thus, there is the possibility of a tie vote. I served on FAC, when there was both an uneven (15) and then an even (18) number of members. When the change was made to 18, it was believed that we would not have an issue with tie votes, but it did in fact happen. To avoid this issue, I recommend adding one additional voting member to the "At large" group, which would give a total of 11 voting members. Second, I strongly believe that there should be allocated seats for the overseas divisions and adjunct faculty members. There are some unique concerns in the overseas divisions, which should be heard when academic policies are developed. In addition, if looking at the number of "core faculty," I think there might be more CTFs than stateside core faculty. Without allocated seats, there is the risk that there may not be any overseas representatives or adjuncts on the AAB. There are a number of ways to do this. One suggestion is to reallocate the "at-large positions": two seats for overseas (one for AD and one for ED), which could be filled by CTFs or adjuncts and one adjunct position. This would leave at least one "at-large" position; two if the number of AAB members is changed to 11 (see previous paragraph about having an odd number of AAB members). Third, with two year terms, it is important to stagger the elections, so that the AAB membership does not risk complete turnover at a given point. I suggest having the first election with half the seats being for one year terms, which would not count against the three consecutive term limit. Fourth, the maximum term limit number is a bit unclear. Can a person only have three consecutive terms? Or could they be on AAB for two consecutive terms and then run a few years later for a third term? Or is there a lifetime maximum of three terms? I agree with terms limits and suggest taking out the word "consecutive"; this would make it a maximum of three two year terms (excluding the recommended one year term mentioned in the previous paragraph to stagger the election cycle). Overall, I am excited to see that UMUC is thinking about a way to develop a more effective method for faculty to provide advice on important academic issues. Response: Thank you very much for your thoughtful suggestions. As mentioned in an earlier response, the scope of our recommendation was limited to the basic structure of academic governance, without going into the details of implementation. We expect that further refinement of the model will be necessary, and assume that many details of implementation and procedure will need to be determined by the new governance group itself. Comment: I keep seeing the comment UMUC is a non-traditional university. Does that mean the goals should be different from a traditional university (a quality education)? What is meant by "non-traditional" beyond open enrollment and lack of academic standards for students? It detracts from the many traditional students that want a good education from a state university. A best evaluation of UMUC can be asked by the question, "Who are the competitors to UMUC?" Strayer, UoP, and for-profit privates with low academic standards seem to be the comparison when looking to national surveys. Is this the kind of non-traditional institution UMUC leadership is seeking to continue? Response: Thank you for your comments. The stated mission of UMUC is to offer "top-quality educational opportunities to adult students in Maryland, the nation, and the world, setting the global standard of excellence in adult education." Given this mission, the university has throughout its history recognized the importance of being willing to change, to adopt sometimes novel modalities for delivering instruction; one such modality, online education, was, and in some quarters still is, considered "not traditional." Focusing on the needs of adult students has been considered not traditional, as well. On June 11, 2015, UMUC President Javier Miyares and Provost Marie Cini hosted an academic Town Hall meeting with UMUC's core faculty. This represented an initial step in a process designed to establish a framework within which UMUC's curricula and academic policies will be developed going forward. Later that same day, members of the core faculty continued the discussion in breakout sessions with the deans of their respective schools—Vice Provost and Dean Aric Krause, of The Graduate School, and Vice Provost and Dean Matthew Prineas, of the Undergraduate School. On June 19, the UMUC Future web page (which had previously hosted discussions of the report of the Ideation Group, UMUC's new business model, and the Strategic Plan) was updated with documents and resources relevant to the discussion of academic governance, and faculty were invited to submit comments or questions via the page's feedback form. Beginning June 25 and continuing through July 21, the university conducted nine facilitated small-group sessions, specifically designed to provide faculty with the opportunity to share their thoughts, concerns, and suggestions about academic governance. Faculty were invited from a variety of groups, including overseas collegiate faculty and adjuncts, stateside collegiate faculty and adjuncts, and stateside NOLs. Some of the sessions were reserved for members of the Faculty Advisory Council (FAC), while others were open to any invitees who were available. With the small-group sessions now completed, a summary of the discussions will be shared with academic leadership. The summary will then be posted to this web page. Not later than September 5,the deans of the two schools—together with core faculty—will submit their recommendations to the president and provost. This report will also be posted here to invite further comment from the university community. Based on that report, President Miyares will submit a recommendation in October to the University System of Maryland Board of Regents for approval and implementation soon thereafter. Comment: How does UMUC define a "Town Hall"? This appears to have been a "meeting" since the invitees were a small, limited subset of UMUC's 4,100 or so faculty. In addition, the vast majority of those officially elected by the faculty to represent them in academic governance of UMUC (and other areas) were excluded from participation. Response: The June 11 Academic Town Hall was convened to initiate a conversation between the administration and the core faculty (stateside 12-month collegiate faculty) on the future of academic governance at UMUC. The university's position is that this group of core faculty plays—and has always played—the key role in the design of UMUC's curricula. Given that core faculty serve as the stewards of the UMUC curriculum, how is this stewardship exercised? 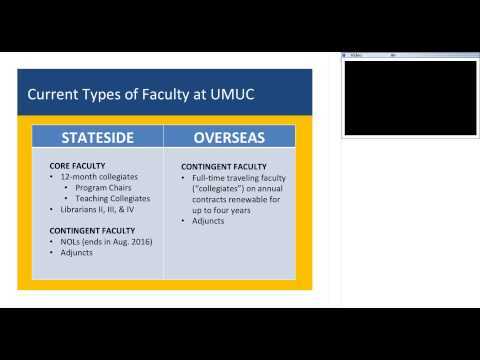 How should UMUC structure the core faculty's advisory role in the general governance of UMUC? How can UMUC improve the process so that adjuncts can provide valuable input to and feedback on their respective courses? Because this Town Hall focused on the role of the core faculty, it was limited to them. However, through the use of this public web page (www.umuc.edu/umucfuture), the entire UMUC community of faculty, staff, and students has been invited to participate. Further, a link to President Miyares' PowerPoint presentation, complete with an audio recording of the proceedings, is available here, in the "Resources" panel to the right. President Miyares and Provost Cini met with the members of FAC on Tuesday, July 21, during their summer governance meetings and discussed a variety of topics; this offered an opportunity for FAC members to provide input and ask questions about academic governance. We have also conducted a number of facilitated small-group sessions to gather confidential input from all faculty: collegiates and adjuncts, stateside and overseas. Again, FAC was invited to participate. We invite FAC and all UMUC stakeholders—either formally or informally—to provide their perspectives on the future of academic governance at UMUC. The deans are now working with their respective schools' core faculty and will report recommendations to the president and the provost. Those recommendations will be shared with the entire UMUC community, including the Faculty Advisory Council (FAC), for comment and feedback before final recommendations are submitted to the USM Board of Regents. You are most welcome! This discussion—and your participation in it—is critical to our future. Comment: In the Academic Town Hall meeting on June 11, 2015, you mentioned the importance of adjunct faculty who are also practitioners in their fields. What of those in the arts and humanities who may be very accomplished in their fields, but whose outside work may bring in little additional income? Will there be a place for them in UMUC's new academic model? Response: The reality is that most of our students transfer credit from other institutions, so the demand for general education courses is relatively small. We do not encourage adjuncts to try to piece together a living working only as adjuncts, and we are concerned that this practice is unsustainable for our adjuncts, for the institution, and ultimately for our students. Given our emphasis on workforce relevance, we strongly prefer that—no matter the discipline—our adjuncts be practitioners who earn their livings in the fields in which they teach. There are many examples of this within the ranks of our adjuncts who teach in arts and humanities. And in graphic design, one adjunct is a senior web designer for a leading provider of SharePoint implementation, design, and integration. Comments: How many active classes were there stateside in the most recent fall, spring, and summer semesters? How many of those classes were taught by collegiate faculty and how many were taught by contingent faculty? Response: A total of 9,467 classes were offered stateside in summer 2014, fall 2014, and spring 2015. Some 88 percent were taught by adjuncts (worldwide, the number is approximately 80 percent). It is worth noting, however, that the role of adjuncts at UMUC differs from the role of adjuncts at other, more "traditional" universities. There, adjuncts may be hired to select a textbook and develop a course, without getting too involved with full-time faculty or too closely aligned with the full curriculum. At UMUC, we have a smaller cadre of 12-month collegiate faculty, some of whom lead programs as well as teach and some of whom teach full time. This core group of faculty is responsible for the overall design of the curriculum, the content of the curriculum, the teaching effectiveness of all instructors, and the learning outcomes of students at the program level. Because of our size and scale, academic programs—and the courses in them—are centrally designed and developed by teams of 12-month collegiates, subject matter experts (often adjuncts hired for their expertise), librarians, and instructional designers and editors. Each course may have hundreds of sections, and so in order to ensure quality and consistency of outcomes, we ask instructors to teach within the design of the course. This ensures that a student who enrolls in PSYC 100 online can expect to achieve a very similar outcome to a student who enrolls in the same course offered face-to-face on a military base in Okinawa. Both students are well-prepared to move to the next course in the psychology curriculum. Adjunct faculty who are primarily practitioners are hired to teach these courses on a part-time basis. This recognizes that adult students are focused on understanding and applying their knowledge, and they want to learn from an advanced practitioner who currently "does"—or recently "did"—what he or she is teaching. We value these adjuncts for the expertise and real-world experience they bring to the learning space. As President Miyares said in his academic Town Hall, the process underway now is designed to answer several questions, including how adjuncts can "provide valuable input and feedback on their courses." The role of the course chair has changed over time. These positions were initially created in response to the rapid growth of online instruction. Course chairs were hired on a part-time basis to review WebTycho classes before the start of a term, essentially completing a readiness checklist to ensure that a syllabus was in place, that it included certain required components, and so on. As our online curriculum matured, the explosive growth in online offerings slowed, and we transitioned to LEO, we came to consensus that faculty should focus on higher-order academic issues. For instance, faculty were needed to serve as subject-matter experts for e-resources, to offer mentoring and guidance to other faculty on using rubrics, and so on. Academic specialists (who are members of the staff, not faculty) could conduct any necessary pre-course checks. Today, in most cases, our collegiate faculty provide the services that course chairs are now asked to provide. In some limited cases, adjuncts are still hired to serve as course chairs in specific programs, portions of programs, or highly specialized courses. Eventually, we anticipate that collegiate faculty will assume responsibility for assuring the quality of each course offering, and the course chair designation will be phased out. Your invitation to participate in this feedback tool described "faculty" as "our 12‐month collegiate faculty . . . while offering more opportunities for our practitioner adjuncts and 9‐month collegiates to provide feedback to their program chairs about the courses they teach." This means that you consider program chairs (who teach seldom, if at all) to be administrators. Only 12-month contract-holders who teach are valued as direct participants in shaping academic affairs, even though they constitute only 10 percent, or less, of UMUC's total instructors. Perhaps more significant, you provide no justification for this approach. As such, recommendations, complaints, suggestions offered by 90 percent of UMUC instructors may only be submitted to administration through program directors who are free to ignore or discard them as they like. As a result of these problems (and others), the current situation at UMUC makes a mockery of the true meaning of "academic governance." The essence of academic governance at authentic universities endows the Faculty Senate with all authority over the academic program. Members of the Senate have either tenure or statutory protections against arbitrary dismissal by administrators who may dislike their views and decisions. Ultimately, a Faculty Senate has the right to take a vote of no confidence in university administrators and ask the Board of Regents to replace them. Typically, these votes are taken seriously. When they are not, faculties usually vote to unionize in order to gain the protections of collective bargaining. Response: We are discussing and exploring nontraditional models of academic governance because UMUC is not a traditional university. The concerns and recommendations stated here deserve consideration. It is vital, though, that UMUC maintain its agility, flexibility, and responsiveness to the needs of the working adults who benefit from our nontraditional model. We are a student-centric university. At any given time, we have more than 3,000 faculty members teaching in some 24 countries, and most are adjuncts who hold other positions. It is critical that our full-time faculty assume a greater role in maintaining and strengthening the quality of our academic programs, ensuring that we maintain our focus on enhancing student learning. At the same time, we must ensure that our governance system fits with our unique mission within the University System of Maryland (USM). Ultimately, the USM Board of Regents will be asked to review and approve any changes in our system of academic governance—a system that already differentiates UMUC from other, "traditional" institutions of higher education. I did read the report and the other two documents and found them interesting; however, I have no specific questions or comments at this time. Ford Rowan's entire report should be made available. Not all faculty were allowed to participate in any of the sessions. Their view of what went on will be incomplete. The discussion regarding a Faculty Senate was not made available. There was considerable discussion about forming such an organization. That UMUC should seek any legislative or USM authorization. Advise only is not sufficient. It is a form of status quo. It is not a form of governance. UMUC should lead the way in forming a unique Faculty Senate to include adjunct representation. It is the faculty who recommend that graduating students have met degree requirements. A full UMUC definition should be provided for CBE along with the associated principles therein. Core faculty should be inclusive not exclusive. Since administrators are consider core faculty if they teach one class a year then the adjunct faculty who have length of service should be included as well. If the Council must be replaced by A "board", appropriate representation of the faculty must be maintained. We agree that a smaller board might be more agile, and would agree to a board of eleven faculty, elected by all 4000+ active faculty, including: four collegiate faculty (with one instructional and one program director each from TGS and TUS), two collegiate traveling faculty (one each from Asia and Europe), and five adjuncts at large. Ex-officio and non-voting representatives may join when agreed and include one each from the library, each dean, the provost, and a professor of the practice. Questions/Comments: Whereas I agree that we must keep up with new media, this should not be at the expense of quality education and relationship building between students and faculty. There needs to be a balance struck here. As the documentation states, we have an older, more responsibility laden student body; unnecessary new media/course changes should not be the focus just because a chair/course developer may want to try out some new things and be competitive with other establishments. It is also important to remember that at times, deployed military don't always have the ability to use all of the new technologies; Internet restrictions may also come into play here; this can mean even simple video viewing. I still believe that adjunct senior faculty with professional and educational experience should have strong input regarding their course content (within the general framework), and there should be a way to maintain that instructor's customized content from one term to the next rather than having to redo their course each term. It is especially time wasting to have to go through the standardized materials to fix typos, grammatical, content and citation errors. On another front, I don't know what is going on with the numerous IT upgrades, but it is at times, disruptive for students and faculty—especially when crucial assignments are due—like finals. Concluding Remarks: I strongly urge that a balance be maintained between adding/learning new technologies and instruction/time be allotted for relationship building between students and instructors. The latest tech additions may be a fun challenge for some, but for others, it is just more things to learn on top of the course content subject matter. Overall, I see the need for standardization and tech innovation, but these course materials need to be prepared by highly qualified professionals, who have tested the media, know the course subject matter thoroughly and have a good grasp of citation, grammar and spelling skills. Learning how to build relationship skills within the classroom is more important than tech advances for their own sake. Thank you for considering my input. I am thankful to have the privilege of teaching for UMUC. It appears from the Recommendations and supporting documents that research was not conducted on the subject of university "shared governance" as one would expect to have occurred in an academic setting, or from a student assigned to write a paper on the topic. Since faculty senates were not allowed to even be considered, the outcome is skewed away from structures and processes which many universities have used successfully for years. Closer to home, CUSF can offer input and expertise on how shared governance structures and processes can effectively thrive while adhering to USM system policies. Each time there are claims of UMUC being different, of needing agility, and competitive secrecy, etc. the major constituencies such as faculty, students, staff and state voters are not being served as they are further removed from input in decision making, consideration, and open communication that state entities including other system schools adhere to. If UMUC seeks to be above the rules and work outside of system policies once again, then perhaps it is time UMUC is removed from the fold and separated from all other system schools? I realize that the UM Administration is not free but is influenced by US Forces, US Department of Education, USM Boards of Regents and USM Chancellor expectations since in order to assure new contracts, it must regularly report to them its decisions. Thus, the UM Administration is interdependent on local, state and national public education institutions which pass laws regarding education. I'm aware that our academic freedom as professors is strongly protected and defended by the AAUP (American Association of Professors), NEA (National Education Associations) and the UM Faculty Senate which should have the final say about academic programs. Yet, we hardly talk about this important aspect as an acquired right professors have since the time of the Renaissance. The Administration should be more flexible with their rules to meet the needs of students and professors. In this regard, our feedback as Adjunct Professors is very important. The UM Administration often reminds us that the UM is not a "traditional" university and that it's "student-centered", yet we know that the on-going process at UM concerning "standardization" permits less flexibility in adopting to student needs dictated by market demands once they graduate. Thus, here I notice some contradiction between adaptation and standardization. For instance, our students should be helped to improve their poor writing skills abilities by asking them to describe in an essay form certain lessons they've learned in the course, instead of just administering short-answer quizzes only. Market demands are that professionals be able to coherently and completely be able to express their thoughts at the place of work. I also believe that adjunct professors who are by definition part-time workers, when and if they decide to become full-time professors, and if they possess excellent teaching records, they should allowed to compete for Chairs in their subjects they've been teaching for 20-30 years and become part of the so-called core faculty, as a promotion and recognition of their great contributions to the UM. Thank you for allowing me to contribute in the discussion about Academic Governance. I have two comments regarding hybrid course delivery, particularly where the F2F elements are delivered in block weekends. AAC should consider establishing a repository of reusable F2F learning object boilerplates that can be adapted for use by faculty university- and program-wide. Standard syllabi should include specifics for the F2F meetings and factor them into the grading distribution. Policies and procedures should be developed/clarified for how student absences from block weekends are handled for hybrid courses. At present this appears to vary considerably across courses/instructors, resulting in inconsistent student experiences. I appreciate and recognize that UMUC wants to be a leader in nontraditional education and I applaud that. On the other hand, after listening to Aric Krause on Saturday, when he said that the adjunct faculty are critical to UMUC's success and that we are the face of UMUC, I feel as if I am listening to two different messages (i.e. Miyares/Cini and Dean of Graduate Studies). The online meeting this weekend was one in which I felt of value to the university. The White Paper makes me feel as if I am not necessary to our mission. With most of the white paper having been written by administrators and core faculty, it does not have the imprimatur of the hundreds of faculty (scholar practitioners) who do the everyday work of the organization. Inclusion is absolutely necessary, whether it is called shared governance or a survey. We adjunct faculty put our hearts and souls into our work with the students. We are the ones who see to it that students are first. Adjuncts deserve to be a significant part of the process in taking UMUC to the next step. Our expertise extends beyond the classroom. And like all in any organization, we need to feel valued. Aric did that Saturday. The White Paper does not. The following excerpts from the report of the Academic Governance Recommendations Team, including the accompanying Focus Group Summary, provide context for my recommendations relating to the new Academic Advisory Board (AAB). "It was clear that many felt that the existing organization did not represent the broad faculty community…. [A] significant number of comments suggested that a "reboot," with a more representative structure in a revised model, was required for success." "Another major theme of the sessions was how to involve adjuncts in the governing process. While they represent more than 95 percent of the faculty, several participants said they felt that their voices are not heard." "…[S]ome said there is a core group of adjuncts who are interested in governance, and they should be part of the process and provided with incentives to participate. ‘We should not lose representation of adjuncts,' one said. ‘We should not turn our back on these professionals in the field.'" "UMUC has a faculty that has expertise in any number of fields, and that expertise should be tapped. ‘We should create a system with a more collegial atmosphere,' one said. ‘The culture can change, but it will take leadership and a cooperative environment.'" I propose the following composition of the AAB in lieu of the current proposal which has the inherent risk that there will be no adjunct faculty members on the AAB. This proposed composition reflects recognition of the significance of adjunct faculty to the university. It is also intended to be fair to the collegiate traveling faculty (CTF). Two from collegiate traveling faculty. This person does not vote; he/she serves as the conduit between the provost and the AAB for regular meetings and correspondences. The provost does not attend ongoing meetings, although there may be regular meetings with the provost and her/his designees. This would provide a total of 15 voting members on the AAB – not only providing a more balanced representative group, but also precluding a tie in voting. Initially, I would provide basic definitions for core faculty, adjunct faculty, and collegiate traveling faculty. I would also delete the word "permanently" in the introduction to Composition of AAB in order to accommodate adjustments due to changes in university operations in the future. Thank you for this opportunity to comment. I, for one, am an adjunct faculty member interested in UMUC's future success and believe in cooperative and collaborative engagement with all stakeholders to achieve it. With that in mind, your serious consideration of my recommendations, especially the proposed composition of the AAB, would be appreciated. I highly recommend 2 more seats for Faculty on your proposed Academic Advisory Council! There are over 70 NOLs worldwide, and we each teach 4 classes, and know the curriculum very well as well as being experts in our professional fields. Please, we are required to teach the worldwide standards "Project Management Body of Knowledge" PMBOK Guide (PMI, 2013) in our Project Management Division but find that these communications standards are not being followed at all by UMUC! We require the Graduate students to cite the professional standards: citations and references to communications best practices need to be inserted. For instance, if there is a procedural conflict - we were "told" that there will be 28 grad students in each class, which lengthens our grading load, work day interacting with emails, texts and questions, etc. - should not that be announced prior to the first day of class? Shouldn't new "grading" approaches to Compentency-Based classes be explained, practiced, trained and announced far prior to the new "model" being implemented?The proposed Academic Guidance committee needs to address this ASAP. If experienced faculty were involved, these workload procedures we deal with daily can be addressed openly, fairly and professionally. We look forward to far more than 5 representatives with over 7,000 of us actively teaching for UMUC. We are excited about competencies and need much more curriculum and grading/evaluation discussion and input. Thank you for including my recommendations to your feedback since the Engage web site is not accepting our comments. I truly appreciate being on a team worldwide, and as an NOL, we face many decisions by June and have much to contribute if asked. As part of the faculty governance process we need a method of systematic meaningful feedback. All faculty are reviewed and provided feedback on a regular schedule. Reviews are by both peer faculty and by instructional development professionals. The student feedback questionnaire is continued but used as part of broader feedback. Two reviews are performed each time: 1) document review of the syllabus and teaching materials, 2) in-class observation. In Year 1, all newly faculty must be reviewed by a Teaching Expert for developmental purposes. Lecturers - every two years. Summary- faculty need feedback to improve. The UMCP approach involving both discipline and teaching specialists is a useful model. I am so very glad the president and provost listened to our suggestions and responded favorably. The addition of a member of the adjunct faculty as well as one from the overseas divisions is a necessary and extremely positive improvement to the representation we would like to see on the Board. I hope you will also consider having these two positions appointed, rather than appointed. Having them appointed makes it infinitely more manageable. Learn about the Academic Governance Town Hall presentation from June 2015.